Studying the experiences of Church members who lived in World War II Germany has enriched the education of Judith Sartowski, a student from Germany. The multi-year research project, involving a team of students like Sartowski, is funded in part by donors to the BYU Annual Fund. Judith Sartowski (’11), a student from Germany majoring in marriage, family, and human development, is on a team interviewing members of The Church of Jesus Christ of Latter-day Saints who lived in Germany during World War II. 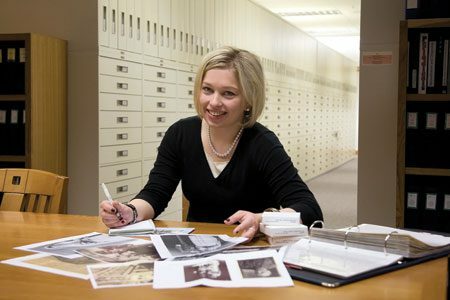 The massive research project, funded in part by donors to the BYU Annual Fund, is giving Sartowski and others the opportunity to gather stories and materials that have never been shared beyond the German members’ families. “It has made college life active instead of theoretical,” she says. And with funding provided in part by donors, master’s of public health student Ryan P. Lindsay (BS ’05) studied street children in the Philippines. He hopes his findings will promote the health and safety of underserved children. These three students and many others from every college have had their BYU experiences enriched by the generosity of donors to the BYU Annual Fund, which exists to facilitate regular giving to the university. “We are gratified that so many of our alumni give to BYU,” says David J. Smith (BA ’02), director of the BYU Annual Fund. In 2008 more than 46,000 graduates gave to BYU. According to the national Voluntary Support of Education Report, BYU ranks near the top for alumni giving among universities with more than 300,000 alumni. • 6 percent went to the university’s general scholarship fund. University fund-raising priorities are reviewed by the Board of Trustees, chaired by President Thomas S. Monson. No administrative costs are deducted from donations, meaning that 100 percent goes to the intended priority.